Solar energy should have a good year in 2019, but that doesn't mean the industry's shares are a buy. 2018 was a year to forget for most solar companies. Policy changes in the U.S. and China led to a drop in demand that caused solar panel prices to plunge, squeezing margins across the supply chain. You can see below that most major manufacturers, like JinkoSolar (NYSE:JKS), SunPower (NASDAQ:SPWR), and Canadian Solar (NASDAQ:CSIQ), saw their shares drop. Even First Solar (NASDAQ:FSLR), which was the big winner of 2017, wasn't able to overcome weak pricing and demand, causing its shares to decline as well. So, will 2019 be any better, or will it be more of the same? As 2018 wore on, solar panel prices fell by about one-third, even in the U.S., where tariffs hit the industry starting in February. Lower pricing led to margin pressure for some solar manufacturers, but for developers who are buying solar panels, the lower costs are great news. 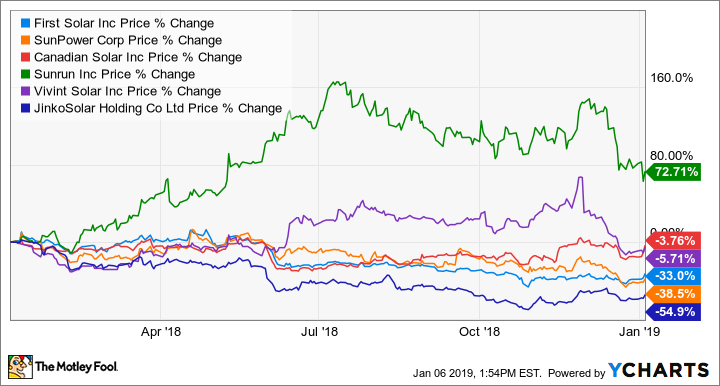 That's one of the reasons the stock of Sunrun (NASDAQ:RUN) is up 73% over the past year, vastly outpacing most solar rivals. Its costs are falling, which is helping margins grow. The same dynamic is playing out at developers large and small around the world. According to the U.S. Solar Market Insight Report for Q4 2018 from Wood Mackenzie and the Solar Energy Industries Association, U.S. bookings through the first three quarters were 11,200 megawatts (MW), causing their analysts to increase their 2018-to-2023 utility-scale solar forecast by 1,700 MW. a big increase considering that just 6,600 MW will be installed in 2018. As good as it is for investors to see strong demand for solar panels, they should be very discouraged by the pricing environment that's driving demand. According to an analysis by EnergyTrend, global commodity solar-panel prices are now as low as $0.22 per watt, a price that will make it hard for most manufacturers to make money. 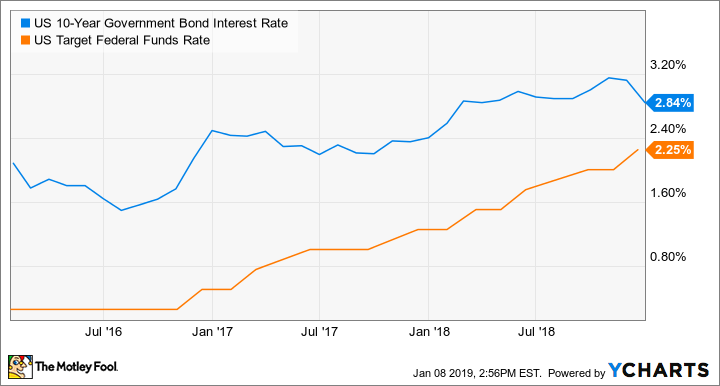 Interest rates are also steadily climbing, making it more expensive for developers to borrow money for new solar projects. Even companies like Sunrun and Vivint Solar (NYSE:VSLR), which are benefiting from low solar panel prices, will be affected by less up-front cash when they sell contracted future cash flows. US 10-Year Government Bond Interest Rate data by YCharts. For a meaningful recovery to take place in solar stocks, I think two things need to happen. First, China needs to implement policies that will drive demand in its own country to over 50,000 MW (enough to power 8.2 million U.S. homes) in 2019 and push global solar installations over 100,000 MW, up from GTM Research's estimate of 85,200 MW in 2018. The increase in demand then needs to drive higher solar panel pricing. Most companies can probably make money if commodity panels are priced between $0.25 and $0.30 per watt, but any increase would be welcome by all manufacturers. The second big impact could be interest rates, which would hurt the entire industry if they continue to climb. But if the Federal Reserve and other central banks slow (or stop) their march to higher interest rates, we could see development surge once again. As it stands, I don't see a sure recovery on the horizon for solar stocks without some major policy intervention. But sometimes that materializes, so investors should be on the lookout for new policies in 2019, especially in the world's biggest solar market, China. Check out the latest First Solar and Sunrun earnings call transcripts.